The multi-dimensional design makes a grand statement from top to bottom. Made of Olde English Wall with insets of Cambridge 4 x 8 Holland Pavingstones from The KingsCourt Collection set in a herringbone pattern on 4 sides. 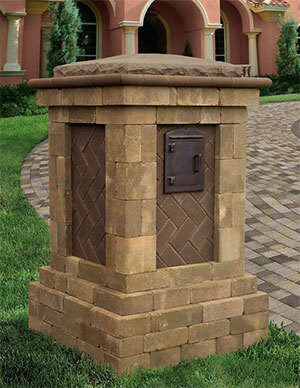 The column is topped off with Bullnose accent trim from The Crusader Collection under a Cambridge Cast Stone Pyramid Cap. Available in 2 sizes – Large (32″ x 32″, 56″ high) and Extra Large (42″ x 42″, 68″ high) – to meet your individual needs. Shown in Extra Large with optional Column Mailbox Insert. Download the Assembled Grand Column Instruction Manual. This unique product group offers two choices to add the finishing touches to a column – a finished cap with or without a second hat dimension (i.e. “Cap & Hat”). Although designed specifically for the Cambridge Pre-packaged Column Kit made with MaytRx® 6 Wall Units, it can be adapted to other column applications as well. No cutting or splitting is required on either a “Cap” or a “Hat” installation. An optional “Hat” can be added on top of the “Cap” for a more dimensional, top finish design. It consists of four specially made 10 in. x 10 in. units. The finished measurement of the assembled hat is 20 in. x 20 in. x 3 in. thick and weighs 92 lbs. To add a popular “cap and a hat” column top design, the optional â€˜Hat” pattern made with the four Hat units can be centered on the top of the fully assembled, four-piece Cap. 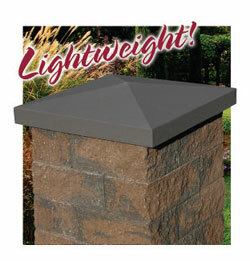 Made of lightweight, earth friendly, expanded polystyrene (EPS) foam core with a heavy duty, impact resistant coating. 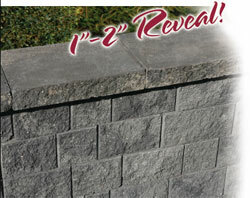 Cambridge Wall Systems and Cambridge Pavingstones colors. 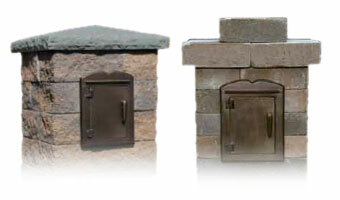 Cambridge Pavers, Inc. warrants to the original purchaser (with a proof of purchase) that should the Cast Stone products (Steps, Caps, Ledgestone Cast Stone, or Cast Stone Slab 3 Pc. Design Kit) installed according to industry standards and in compliance with our installation guidelines, prove defective, it will be replaced without cost. Replacement labor is not included. This Warranty is good for as long as the original purchaser owns the real property on which the Cast Stone was installed. 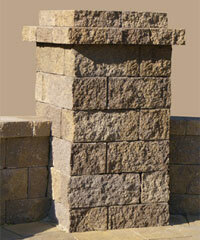 Cast Stone products meet or exceed ASTM C672. The use of de-icing salts (sodium chloride (NaCl)) will alter the surface texture of these products over time. Cambridge cannot guarantee the color match of any replacement units. 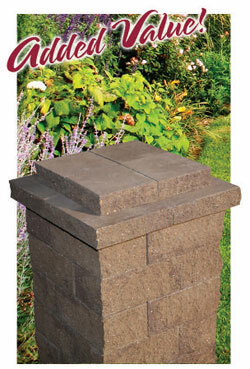 Cast Stone products can not be compacted.